I admit I am still at a loss with most spices. Now that I live in the Middle East, close to India, the spice shelves are packed with spices I am not even familiar with. Although I can identify a lot more spices by their looks and smells than 7 years ago, before I moved to Dubai. But I don't know how to use them. I am still very clumsy with most spices. If I ask my Indian neighbors what they put into their curry, I loose count. And what makes even worse for me, that they do it so naturally. In most cases they can't even tell me how much they put in. Nothing gets measured up in half or full teaspoons.Whenever I use spices in my curries, I strictly follow a recipe, but still feel like I don't know what I am doing. But then again, I love curries. So what will make me happier than a curry recipe that only has three spices in it of which I know all? Furthermore, if the recipe is an authentic recipe from Tanzania. 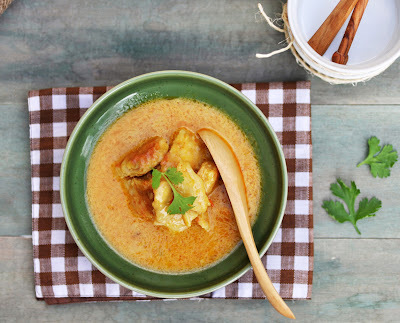 It's Sips and Spoonfuls's Pan Fried Fish in Mild Coconut Curry. Sukaina must know. It's her heritage. I would have never thought that such little ingredients, chili, turmeric and coconut milk can make such an amazing dish. It is the easiest thing to cook, yet it's amazingly tasty. Needless to say that this fish curry is now a staple in our house. Marinate the fish with lemon juice, salt and red chili powder. Heat half the oil in a frying pan and fry the fish on medium heat for 4-5 minutes on each side or until golden brown. Set aside. In a pot, heat the remaining oil and fry the garlic for a few seconds. Add the grated tomato, turmeric and salt to taste and fry till the tomato has cooked, about 4 minutes. Stir in the coconut milk and keep stirring till the mixture comes to a boil. Lower the heat and simmer half covered for 15 minutes. Add the fried fish and simmer for a further 10 minutes. Serve with rice.